Cast Revealed For The Ultimate Fighter: Team Benavidez vs Team Cejudo » MMA H.E.A.T. 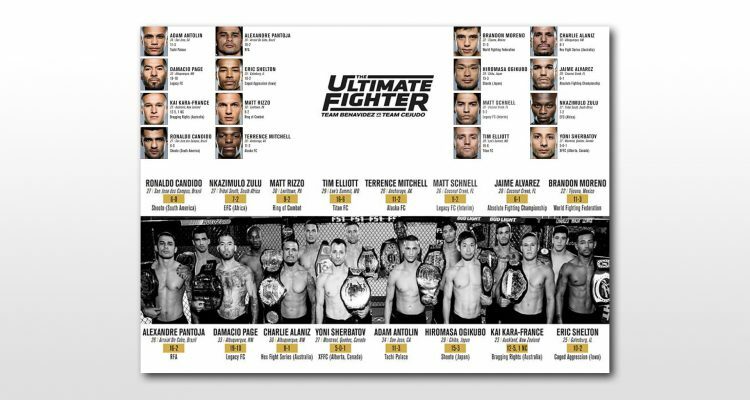 Champions from around the world will descend upon Las Vegas for the upcoming season of The Ultimate Fighter®. This season, 16 seeded competitors, all champions in their current promotion, will be coached by two former flyweight title challengers, top-ranked Joseph Benavidez and No. 2 Henry Cejudo. Season 24 of the long-running UFC® reality show debuts Wednesday, August 31 at 10 p.m. ET on FS1. The series is the network’s highest-rated and most-watched original program since inception in August 2013. Last season’s finale, headlined by a strawweight world title bout between coaches Joanna Jedrzejczyk and Claudia Gadelha in, was the most-watched on FS1 since the first fall season in 2013. No Comments on "Cast Revealed For The Ultimate Fighter: Team Benavidez vs Team Cejudo"